Customers wait to purchase the Apple iPhone 5 outside the Apple Fifth Avenue flagship store in New York City. 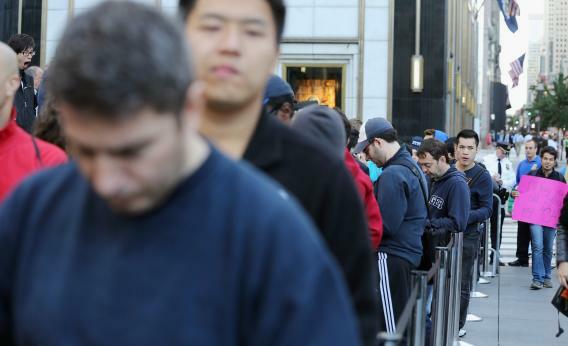 I never considered myself the type to stand in line for an iPhone, but I did it today. I told myself it was for professional reasons, but admit a little part of me really did want to see how it felt to take part in this mass ritual of modern consumerism. I didn’t go to an Apple Store, mind you—I’m not a masochist—but to a small AT&T outlet on New York’s Upper West Side. I arrived shortly after it opened at 9 a.m., having tried two other stores first, and was heartened to find only about a dozen people queued up along the sidewalk. As I took my place at the back of the line, a nice woman named Crystal came up and asked what size and color I preferred. “Thirty-two gigabytes, in black, please,” I said. She replied, “How about 16 gigabytes in white?” As I mulled this unexpected counter-offer, she added that she was sorry, but that was all the store had in stock, and there was no telling how long it would be before reinforcements arrived. I acquiesced, and she offered me a donut. The next customer to join the line, a 19-year-old computer science major at Columbia, turned out to be in the same boat. He too resigned himself to 16 gigabytes in white, even though that amounted to a memory downgrade from his old iPhone 4. “I guess I’ll just use the old one like an iPod,” he mused. I asked him why he was so eager to get the new phone, and he told me he’s working on developing apps for iOS. The middle-aged gentleman in front of me, already the owner of the year-old iPhone 4S, had no such excuse. “I just like to have the newest one,” he said, a little abashed. The line shrunk at a steady pace, and by 10:15 I was walking out of the store with my new, white, 16-gigabyte iPhone 5. “Congratulations,” the store manager said warmly, as though I had just achieved something. I stepped out onto Broadway with my gleaming gadget in hand, torn between the desire to wave it in people’s faces and stow it in some deep recess where no one’s grubby mitts could get at it. I settled for FaceTiming my dad, because I could. He sounded duly impressed by my purchase, if a little surprised that I had settled for a version that had no more memory than the old phone I’d been nursing for many years. I mumbled something about the cloud.